Is it just me, or did October just fly by? I hope you all had a good one. I thought I would do a quick catch up post. The last month has been a busy one between events and meetings as well as some other projects in the works, I haven't had as much time to blog as I would like. Last weekend was the October bank holiday weekend here in Ireland and my sister was home from Nice. It was lovely to catch up with her and hear about all she is getting up too. I also had to do some work for Eventbrite . So the weekend went pretty quickly but it was a good one. Between catching up with my sister and working on a travel section with Eventbrite it has really started to give me the travel bug. Starting my dare I say it New Years Resolutions early, I want to travel more. Scratch that I am going to travel more. October was filled with a number of blogger events, which I was only more than delighted to attend. 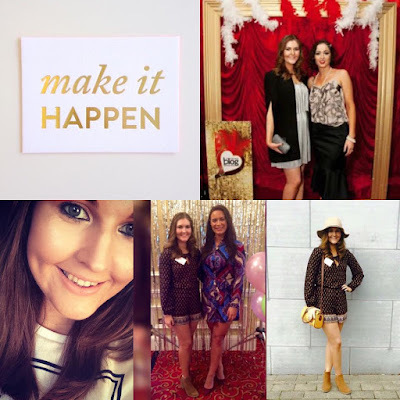 One of which was the Blog Awards Ireland which I was made a finalist in the 'Best Fashion Blog' category, much to my surprise but I was so delighted. The event was held in the Tivoli Theatre , it was 1920's themed and people really went with the theme which was fun. I guess people are in the Halloween spirit so dressing up was easy and fun! I wore a black cape that was very kindly gifted to me from Boohoo. Even though it was a 1920's theme I wanted to keep it modern and classic. I loved wearing it and felt super stylish! I then wore a silver flapper dress from Forever 21. My Mum bought it for my sister a few years ago and she didn't like it so I kept it and wore it once for a New Years Eve night out. As soon as I saw the theme for this event I knew I had to wear it. My lace up heels are from Penney's and my clutch was also from Forever 21. I went to the event with Sandra from My Style Pursuit she was finalized in the 'Best Beauty Blog' category. We had such a good night. We stayed in Dublin for the night and of course we had to do a bit a shopping before we left. An other blogger event I had this week was 'Beauty Brunch' with #itwbn and Joanne Larby. It was an other brilliant day. I swear these girls never fail to disappoint. You can read about this event here. Speaking of bloggers I also got to attend a Flormar masterclass with Grace from FacesByGrace. She is an amazing makeup artist and so professional. And just if not more lovely and bubbly than on snapchat! I was delighted to finally meet her. Between all of these events, meetings and blogging I am also going through a career change or career enhancement whatever you would like to call it but I will for sure fill you all in as soon as everything is finalized. So yes October has been a super busy month but I wouldn't have it any other way. "The busier you are, the more productive you are!"